$10.00 OFF Save $10.00 on TurboTax at the TurboTax Store. Now at Intuit.com (the official TurboTax Store), you can get $10.00 off the download version of TurboTax Basic when you follow the above instant promo code. That will drop the price down to $19.99. To activate this discount, just follow the above link and it’ll be automatically applied to your purchase. Offer will be valid through to the end of this month. Now on Sale! 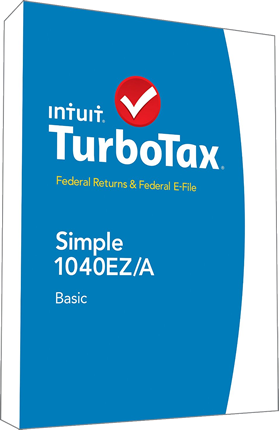 Find TurboTax Basic on sale + free shipping at Amazon. TurboTax Basic is now on sale at Amazon. Choose from either the boxed or digital version Basic Fed + Efile. Free shipping is included on order above $35.00 but you can also choose to download your order and install the software right after checkout. Prices tend to vary so please see site for today’s deals and special offers. Try it Free Try out TurboTax Basic for free before you buy. If you haven’t used TurboTax before or if you want to test out the difference between versions for yourself, then you can start your actual return for free to see if you like it before ordering. Unlike a traditional free trial download, there is no software to install as you complete it all online at TurboTax.com. You can save all your work as you go along and once you near the end of your return, you can decide to either file with them (any pay for the copy at this point) or just simply cancel. If this is your first time filing taxes or you need some assurance while completing the process, TurboTax Basic offers a step-by-step guide to complete the return with confidence and accuracy. It uses a simple questionnaire to get all required information to file taxes. And it does it in an environment free of clutter so you can see exactly where you are and focus on the task at hand. Preparing taxes starts by answering questions about your life and what happened to it in the prior year. Common questions include your filing status, where you lived, did you start a new job, buy a house, retire, whether or not someone else can claim you as a dependant, did you have children or supported someone. If this is not your first time filing taxes using TurboTax, the software will transfer that information from a prior return. All you have to do is to verify that the information you provided last time is still accurate. It will go over the same categories as just mentioned. Similarly, the software can import your W-2 forms. TurboTax is able to pull that information from more than a million of participating companies. This list keeps growing and it is intended to save you time. Although entering income details from a single W-2 form may not sound like a big deal, imagine if you and your spouse each had couple of jobs. As you continue your tax preparation, the progress is automatically saved. There is no need to finish it in a single setting; you are in charge of your time and you can return where you left off at more convenient moment. There is couple of things TurboTax Basic edition stands by: accuracy and maximum refund. Intuit, the parent company of TurboTax, is always up to date with the latest changes to the tax code or anything else that may impact the final amount of your refund. Because of that commitment TurboTax is able to analyze all possible credits and deductions guaranteeing you the maximum refund or minimum tax liability. All this is achieved with 100% accuracy of calculations. The software completes error checks before the return is filed and commits to pay for any penalties imposed on you by the IRS if the error was caused by TurboTax. If you decide to efile the return, you can select to receive your refund as a check or direct deposit. Filing taxes electronically and opting for a direct deposit shortens the time to have your return processed and money deposited in your account. Additionally, you can opt to pay for the TurboTax software with your refund so you will never have any upfront out of pocket expenses. TurboTax Basic is most suitable for relatively simple tax returns involving fewest forms. But even those type of returns can be a headache. That’s when the greatest benefit of TurboTax Live comes in. If you’re unsure about any part of what you entered or need clarification on why taxes are calculated certain way, you can talk to a CPA or an IRS Enrolled Agent (EA). The best thing about this feature is that the CPAs will answer your questions whenever you get stuck preparing your returns as you have unlimited access. They can also review your return line-by-line to ensure accuracy, sign it, and guarantee there are no mistakes. This will give you a peace of mind that you are getting the highest possible refund. Another benefit of speaking to an agent is that you can get guidance on all the documents you need to complete the process. It takes highly organized individuals to have all the paperwork in order and we often don’t review what we have until we sit down to prepare taxes. The CPA or EA can ensure you have all the necessary paperwork and help find the required information to enter into the return. Import your prior year tax return even if filed with other tax preparers; import information from a PDF – just drag a file from your computer desktop and drop in the upload window. See how each information you enter impacts your refund or amount you owe; use ExplainWhy feature to get more information of your decisions – if you still have questions, contact a CPA. File taxes electronically and request a direct deposit to get the refund in shortest possible time. Review your credit score and the individual components that go into its calculations; learn more about your financial health by reviewing income, credit score, and debt-to-income ratio all together. Once the federal returns are done, all the necessary information is populated into the state forms making that process that much faster and error free. TurboTax continues to be one of the easiest tax programs available. It has been consistently ranked #1 by many rating services for that very fact. See all our TurboTax Deals! Before you get TurboTax, see the promotions and coupon codes available on H&R Block tax software. Signup and we'll email you when TurboTax 2020 will be released.